What is it? A multi-character cyberpunk adventure game. In this neon-drenched vision of the future, connecting to the internet whisks you away to a virtual world called the Trance. It’s where Latha, one of Technobabylon’s protagonists, is happiest. In ‘meatspace’ she lives in a dilapidated government apartment, wearing printed overalls, eating grey nutrient slop from a food machine; in the Trance she looks like an extra from The Matrix and spends her days in a dazzling cyber-world made of shimmering holograms. I don’t blame her. Regis, another playable character, couldn’t be more different. He’s an old school cop who doesn’t trust this fancy new technological world, which is governed by an all-seeing AI called Central. Central has a knack for predicting crimes before they happen, but Regis doubts its effectiveness. His partner, Max, is a younger cop who Trances like Latha, but respects his old methods. Central, represented by a computerised female voice, is forever scolding Regis for taping over the lens of the camera in his office. Regis and Max are investigating a series of murders by a killer nicknamed the Mind Jacker. Much of the game is like a sci-fi police procedural—Deus Ex meets Police Quest—and sees you investigating crime scenes. I won’t say how, because spoilers, but Regis and Max’s story soon crashes head-on with Latha’s, revealing a conspiracy. It’s cyberpunk: of course there’s a sinister conspiracy to uncover. The story is fantastic. It’s well-paced and written, with plenty of surprising twists. The world design is pretty standard for a setting like this, with skyscrapers, flickering neon signs, people with mohawks, and lots of glowing screens. But, despite the low resolution that typifies all Wadjet Eye games, skilled use of lighting, shadow, and atmosphere make it a place you want to exist in. The strong art makes up for its technical shortcomings, from Regis’s balcony overlooking the city—complete with genetically engineered tree—to the palatial home of a crime boss. If you like that whole Blade Runner aesthetic, this is a world worth visiting. I have to give a special mention to the screen that appears when you transition between areas as Max or Regis. You see a car driving down a futuristic highway, neon-lit skyscrapers in the background, lights reflecting off its windows, as some really cool ambient synth music plays. It’s a shame the area selection screen has to pop up and obscure it. The music is, incidentally, really good throughout, with echoes of Michael McCann’s score for Deus Ex: Human Revolution. Puzzles are, this being an adventure game, a big part of Technobabylon, and they’re mostly good—with a few exceptions. The best are the ones that play to the setting, like the section where you have to get information out of a robot maid by sticking different personality chips in her—including one from a chirpy AI-powered food dispenser. I’d give more examples, but, again, spoilers. The worst are the ones that fall back on traditional point-and-click puzzle absurdity, combining items in ludicrous ways and so on. But mostly they’re logical, challenging, and satisfying to solve. Wadjet Eye have been publishing old-style adventure games for years now, and this is one of their best releases. Developer Technocrat has created a cyberpunk world that, while riffing on a dozen other examples of the genre, manages to have a personality of its own, populated by a cast of genuinely likeable characters. Some of the puzzles leave a lot to be desired, including one involving a fishing rod and a magnet that feels out of place tonally with everything else, but there are some great ones too. 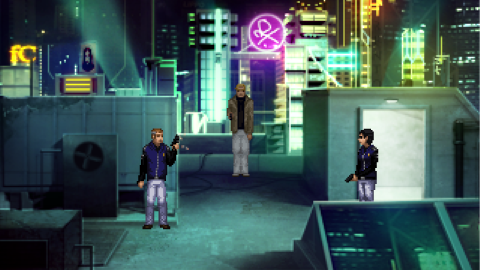 If you want to be told a good story in an interesting world, Technobabylon is worth a look.